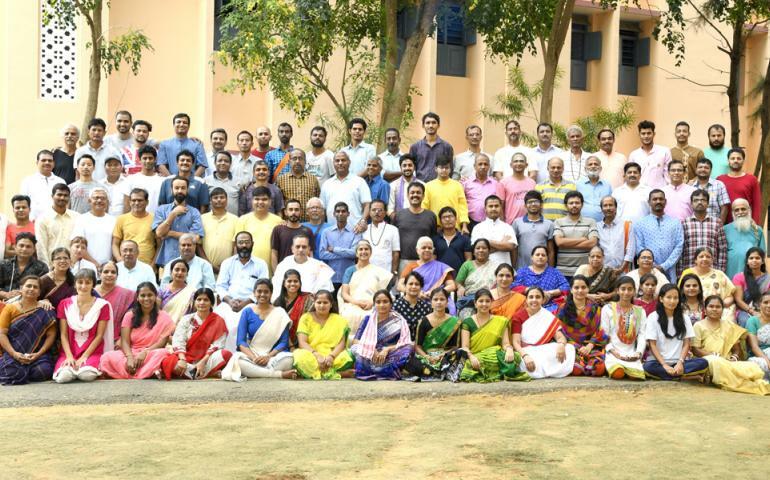 All India Yoga Shiksha Shivir was held in Vivekananda Puram, Kanyakumari from 22nd Nov to 5th Dec 2018. The reporting day was 21st November 2018 and most of the participants had arrived and reported during the day. Sixty Three Participans (For YSS) and Nineteen Participans (for YCC) from 16 different states viz, Arunachal Pradesh (4), Assam (11), Bengla (1), Bihar (1), Andhra(2), Tamilnadu(6), Kerala(3), Karnatak(14), Maharashtra(22), Gujarat(2), Delhi(3), Panjab(1), Jarkhand(1), Himachal Pradesh(1), Uttar Pradesh(4), and Uttarakhand(1) are reported. Three sisters and two brothers from spain. Camp was started with BhajanSandhya and Introductory session, wherein the participants were given orientation for the camp on 21st Nov 2018. The medium of the camp was in Hindi and English. The 63 participants of Yoga ShikshaShivir and 19 participants of Yoga Certificate Shivir were organized into Ten different groups, The Names of Holy River Ganga, Yamuna, Godavari, Krihsna, Kaveri, Brahmaputra, Narmada, Saraswati, Sindhu, Kshipra given to each groups. Six English groups and four hindi groups. The Fifteen Day camp had Morning Prayers, Gita-Pathan, YogaAbhyas, Shram-Samskar, Theory sessions, Manthan, Geet-Abhyas, YogaAbhyas, PranayamAbhyas,YogaVarg, Cyclic Meditation, BhajanSandhya, and concluded with Prerna se Punuruthhan. The lecture sessions were on the topics of: Concepts of Yoga,Rajayoga, Bhakti Yoga, and Karma Yoga, Bharateeya Samkriti, Kendra Prarthana, Maneeya Eknathaji, Swami Vivekananda, Story of Vivekananda Rock Memorial, Challenges and Response, Vivekananda Kendra-Concepts and Activities, Gherend Samhita, and Yoga in Daily life. During Manthansession Participants discussed on the subject based on various lecture sessions. During Shram-Samskar, participants took care of the cleanliness, arrangement and management of the premises, accommodation, class rooms and dining hall displaying team-spirit and selfless service. ON 27th november participants visited Vivekananda Rock Memorial and 1st December Participants visited Marutva Malai and Vivekananda Pictorial, Gangotri exhibition. The Shivir went on well in a congenial, spiritual atmosphere with moderate discipline and affection. Many of the participants have expressed their willingness to devote their time and energy for the Service of the society through Vivekananda Kendra. 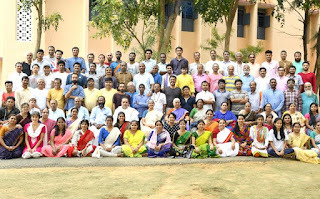 Some are enrolled as Patrons thus joining the large family of Vivekananda Kendra.